Through my own experiences with oppression and privilege in activism, I have a lot of experience with allies – whether I am working with allies to my own community or being an ally to other groups. This leads us to the first item on the list. Over the years I have tried to learn to be a better ally, to POC in particular, in a variety of ways that could easily be applied by male allies in feminist movements. I’m serious. None of us are special for supporting anti-oppression movements. Being an ally is merely part of being a decent person. You know that one guy in almost any feminist circle that constantly says things like, “I’m not like other guys, they’re all misogynists”? That’s what we sound like when we expect to be congratulated, lauded or praised for being allies. Activism is about progress for an oppressed group, not how clever and progressive individual people are for having decent opinions. If liberation movements were plays, allies would be the trees in the background. No matter our leadership skills, cool new ideas or experience within a movement, if we are not a part of the oppressed group we should not be taking a leading role. Cis-straight people should not make speeches at Pride events, white people should not be writing articles about black culture and men should not be chairing organisations dedicated to the liberation of women. Allies are really useful and valuable members of many activist movements, but they should understand this is not their movement. Good ways that allies can help include contributing skills, sponsoring through events and merchandise and amplifying voices – sharing articles about disability by disabled people, for example. I know, sometimes it can be hard to hear that we aren’t wanted in a space, but the key thing to remember is that it is not personal. There are some things that those who haven’t experienced them just do not understand. Oppressed groups need safe spaces where they can discuss things with people who understand what they are going through. When these spaces are created, respect them and their importance for progression in any movement. And when you are not sure, it never hurts to ask “Are allies welcome?” If the answer is no, move on. A few months ago in a Facebook group for the LGBTIQA branch of a political group we posted a reminder that the group was for LGBTIQA people only, not allies. 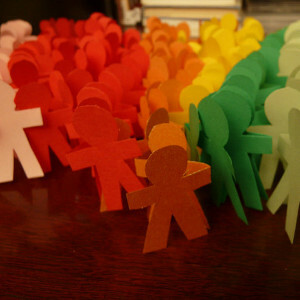 Several allies objected, and one popular argument was that people used the group as a place to learn about LGBTIQA issues. When activists post stories or calls for support in private groups, they are not doing it to help educate you. I personally find it quite upsetting that someone can look at accounts of my own pain facing sexual harassment that I might post in a group to find comfort as a tool that they can use to learn. Nor is it appropriate to expect every activist you see to explain and justify and argue their positions on things. There are dozens of websites, this one included, and books and documentaries and articles dedicated to educating people about liberation movements. As allies we cannot burden communities by expecting to be babysat throughout every basic term. Nobody in any movement is infallible. I have been inadvertently ableist, transphobic, cisnormative – you name it. And that’s okay. The thing that determines if you do wrong is what happens after you make the first mistake. If a member of a liberation movement tells you that you have been oppressive, do not argue. Only a woman can define sexism, only a person of colour can define racism, and only a disabled person can define disablism. Apologise and take ownership of what you have said or done. If you do not understand where you went wrong, ask for it to be clarified so you can learn more. Think about how to avoid doing it again. Finally, move on a better person. Those are my five hints for allies – if you can think of any more, comment below! The image is by Emily Barney and is used under a creative commons licence. 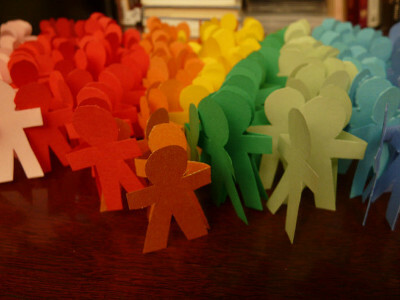 It shows different brightly coloured paper chains in the shape of stick figures.